Loyal Trust Matters reader Jim Bullock is author of maybe the best piece I’ve seen on the structure of negotiated contracts. It’s called “Chinese Contracts,” and I recommend it. But Jim has a recommendation of his own to make: a small credit card processing business in Seattle. Charlie, I came across a company I think you’d appreciate. Called Gravity Payments, they do payment processing for small to medium sized businesses. They are growing like crazy & profitable. They are interesting because of the way they do business. Payment processing statements are opaque. The industry is built around a pretty big assumed churn, and a pretty high advertising- and marketing-driven cost of new customer acquisition. By offering transparency, essentially some consulting on what it all means, and limited guarantees on cost of service, Gravity Payments has much lower churn, and essentially word of mouth driven marketing leading to much lower costs of sale. Because this gives them a typically longer (and I suspect less costly) relationship with each customer, they can charge less. Thus, customers move over because they are dissatisfied with their previous service, and now can feel cared for. Then they stay forever because they also save money. I haven’t given the trust aspect of this business enough play, nor have I done justice to how the need to be fair and do right shines out from the remarkable young founders of this company. I saw these guys at a business plan competition I went to (they took second place). Price says he and Gravity’s employees feel passionately about local businesses, saving their customers over $1,000 per year depending on the size and revenue of the business. How does Gravity Payments choose employees? Currently employing 15 full-time employees, Price attributes their excellent staff to choosing employees using the method of axiology. Axiology is a "branch of philosophy dealing with ethics and values." The Price brothers applied this idea to Gravity, taking a person and fitting a job to them rather than fitting the person to a job. This attitude toward employee management is apparent as an integral part of how the Price family applies their values in the business world. Axiology was introduced to Dan and Lucas by their father, Ron Price. Ron Price is an organizational consultant working through his own business, Lifequest. His clientele include Hewlett Packard, Pacific Steel and Recycling, and First Bank of Idaho. Axy, smaxy, whatever. Sounds like it works, and one can see why. Thanks Jim for another case of the paradox of trust: do right by your customers, and they’ll do right by you. As long as you make it the outcome, not the goal. 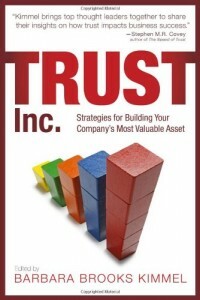 Who Should You Trust on Trust in Business: Yankelovich or Fortune? Who do you trust when it comes to measuring trust?